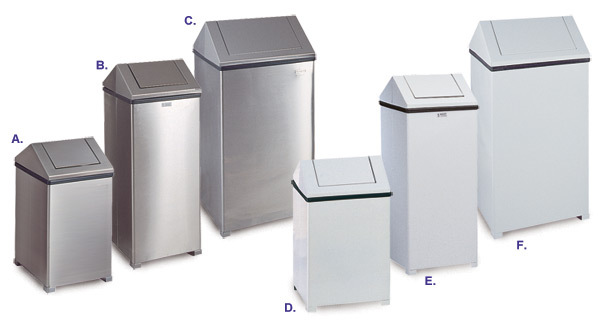 Ideally suited for restrooms, clean rooms, operating rooms, and professional kitchens, these square open top steel trash receptacles provide a clean modern receptacle for any environment. The exceptional durability of the smooth powder-coated or stainless steel finish provides a low maintenance solution for prominent areas. The hinged top features a self closing springless dual entry disposal door. Nylon base pads are included to protect floors. Receptacles are available for purchased with either poly-bag retainer bands or rigid plastic liner.